Starting teaser: Following this and other MMM articles, I lost 20 pounds (135 lbs to 115 lbs; 5’6″ tall) in a little over seven months and to quote my husband “gained a six pack.” I have kept the weight off even now 1.5 years later. Backing up, I started following MMM back in April 2014 based on a very wise friend’s recommendation. MMM and his family (thank you Mrs. MMM for setting up the site!) have completely changed our lives for the better in all areas. I figured that it probably it is not going to be read being at the end of comments (fine by me), but I wanted to do an electronic way of getting down on my hands and knees and bowing to MMM and his wisdom. With regards to barbells, I actually could not focus on this method due to back and rotator cuff injuries (prior snowboarding- I am embarrassed to say, a lot of costly snowboarding). My doctor said that I was overweight (I was like damn! Seriously?! ) and the excess weight probably was contributing to my back problems. I would throw out that we do a lot more hiking, swimming and outdoor activities because of MMM which also contributes to being fit. I think that goes back to the essence of what MMM is telling us. Every piece of everything that you do clicks together to create an overall picture of health and happiness. Everything IS connected. We still have a looooooooooonnng way to go on our Mustache journey. But truly it is a fun journey of happiness. Isn’t that what life is really about? I did crossfit for a few years, and like you, absolutely fell in love with the clean and presses. The other olympic lifts were always my favorite part. It’s the one part I truly miss since quitting. Dumbbell clean and presses just dont measure up. Reading this article gave me a new “must have” when I purchase a home: a space for a home gym. Can’t agree to this one. Hitting 45 years old working at a PC I needed to make a choice, let the shape go or work it off. While I hate anything that resembles a monthly utility bill I did tally up the costs of some good weight equipment Vs space at home Vs Time. I went with the gym next to the office. The lunch hour for me is usually dead time wasted, now I can get a good pump. What I didn’t expect was the emotional boost I get from it, going through a divorce right now can get me right down so motivational speakers like Arnold on YouTube “Even when I didn’t want to do it I still got up and did it” gets me into the gym on my worst days of depression. When I’m leaving the gym I’m feeling great, loving the tunes on the radio, enjoying my food and overall feeling positive again. Hard to put a price on that. Maybe €50 per hour in divorce counselling. You could argue that you get that from the weights at home but you have to factor in lifestyle. 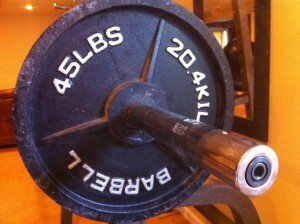 And the quality of the weights in this gym are outstanding. Then there are also machines that allow you to work on parts of the body that you can’t easily do with free weights. I’m talking the space of a small warehouse Vs 10′ x 10′. As a person that often works late shifts and travels I found that a home gym was hard to accomplish in practice when I needed to up my cardio. This is because I just cannot run around my city at 10pm for a good cardio burn. However, I did find that the jump rope is a super cheap lite weight mechanism that allows me to still get a good pump in correlation with thorough bur pee routine regardless of time/space constraints. Just another tip for the readers! I don’t have any affiliation with them, but I like their content and I want them to succeed, so check them out Mustachians! And stay Buff! A few people have suggested bodyweight training as an equipment-free alternative, and I completely agree for upper body – pullup, pushup (+ muscle up if you can manage them!) and ab variations are all you need, http://www.alkavadlo.com/ is a good resource, as is the book Convict Conditioning someone mentioned. But for for lower body, certainly you can get most of the health benefits from bodyweight (and one-leg squats are great for flexibility), for me I missed the heavy weight feeling of squats and deadlifts (this is not because I am awesomely strong by the way, my max deadlift is 127.5kg @ 70kg bodyweight) and I think they have better carry-over (no pun intended!) to athletic performance. I am hoping to acquire a barbell set eventually, but for now I am using sandbags, which I find have most of the benefits of barbells need to substitute variations like shoulders and cleans for deadlifts, and lunges for squats) with some extra benefits (grip, and ability to manoever odd-shaped objects) and are very cheap to put together – http://rosstraining.com/blog/ has good information on these and lots of other inexpensive DIY exercise equipment, I think moustachians will approve!